Sometimes even the widest of wide angle lenses just can’t capture a large enough field of view. Here a multi-shot panorama could be the answer, as with the right tripod head – and some decent stitching software – you can shoot huge vistas and at a higher resolution. While it is possible to snap adjacent overlapping images hand held, you can get straighter and more seamless results by using a tripod. Of course, most standard ball heads already include a pan base, but a dedicated panoramic head offers extra precision. Some can also rotate with click stops at pre-set intervals, giving consistent image overlaps for optimal stitching later. But for maximum impact, you’ve got to go big. Multi-row and 360x180-degree spherical panoramas that create a wraparound virtual reality require a head that lets you precisely position your camera horizontally and vertically. You’ll also need plenty of patience to nail perfect results, but if you’ve got deep enough pockets, automated motorized heads can do the hard work for you. You can also get instant 360-degree images by using one of the growing number of 360 cameras like the Ricoh Theta, but these can't match the resolution possible by using multiple stitched images snapped by a conventional camera. Which camera? There are plenty of panoramic heads out there, but many will be too small to accommodate a large DSLR with a full-frame lens. On the go: Go for a compact folding head if you've got a small DSLR or mirrorless camera and it can stow in kit bag ready for spontaneous opportunities. Select software: Even the most trick panoramic head needs to be accompanied by stitching software. There are plenty of powerful options, and some are even free. The nodal point: Shooting spherical panoramas requires a head that lets you rotate your lens’s entrance pupil - known as the nodal point - so you don't end up with troublesome parallax problems. Going handheld: Gone out without your panoramic head? You can shoot a single-row panorama handheld - just pan flat and level, ensuring each consecutive shot has a decent overlap with the last. Stitching software will do the rest. Bonusprint gets off to a good start with its clever uploading page that automatically detects the aspect ratio of your images and selects an appropriate print size to match. In addition to the usual 7x5 option, there’s 7.5x5 to suit a 3:2 APS-C or full-frame image, 6.5x5 caters for four-thirds cameras and smartphone shots, and there’s a 5x5 square format. All these variants cost a reasonable 14p per print. Delivery pricing is average at £2.99, but we received useful tracking email updates and the prints arrived in just 2 working days. Thankfully print quality doesn’t let the side down. Colors are accurate, highlight and shadow areas well resolved, and there’s plenty of fine detail. Those comprehensive aspect ratio options ensure no nasty cropping surprises, and only the Jessops Photo images could match the neutrality of our black and white image samples. Our only minor gripe is contrast could be slightly boosted, as some of our prints look a little flat under close scrutiny. As its name suggests, this gadget is all about helping you shoot giant gigapixel panoramas comprised of hundreds or even thousands of images. It’s a trick that’s nigh-on impossible with a conventional panoramic head. 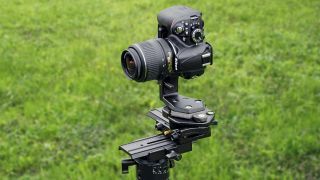 All you have to do is enter your lens’s field of view, as well as where you want your panorama to start and finish, and this electronic cradle will automatically pan your camera and fire its shutter. You can’t quite capture full spherical pans, but the 360x155-degree range isn’t far off, plus there are multi-exposure and bracketing options for creating HDR images. This latest V (for video) edition of the Epic Pro adds the ability to pan horizontally, vertically and diagonally with your camera in video mode, so you can create stunning video timelapses. Factor the bundled GigaPan Stitch software and the price is fair for such advanced kit, though the software will require some serious computing power. A hefty tripod is another must, as at 3.3kg (plus the weight of your camera) the Epic Pro V is no lightweight. Rollei’s entry isn’t far off the size of the mighty Manfrotto 303SPH, but with fewer components and a lighter build, it’s half the weight at 1.2kg. The tall vertical arm gives you room to rotate a longer lens, and the 3kg payload capacity is enough for a full-frame DSLR setup. The pan base has selectable click-stops at 15, 24, 60 and 90-degree increments, and it locks positively into these stops when rotating. The upper, vertical pan motion is just as precise and has click stops every 15 degrees, making it much more useful than the Andoer head when using a longer lens to capture a multi-row panorama. Another nice touch is the bracket linking the horizontal base plate with the main vertical arm. Loosen the clamp under the bracket and the arm can rotate, swinging your camera out so it can shoot straight down to capture the nadir image with less tripod visible in the frame. Dropping big bucks on a head you may only use occasionally can be painful, so this keenly-priced option is tempting. First impressions are good, as the components feel rigid and lock in place positively. There isn’t a great deal of travel along each slider, but it’s enough to centralise a camera up to the size of a small DSLR. Andoer claims a 10kg max load, but this seems optimistic. The compact rotating base has five click-stop increments at 15, 30, 45, 60 and 90 degrees, though the click action isn’t particularly precise. Rotation is at least smooth, and there’s no excess movement in the bearings. The same precision benefits the vertical arm’s rotation, and this has click-stop points every 30-degrees. Trouble is, that’s easily too much vertical panning distance to allow for overlapping shots when using a lens focal length any longer than about 40 degrees, and the arm can’t be securely clamped at positions other than 30-degree increments. This head is a pleasure to use and very good value, but only if you’ll be using a wide-angle lens. With its slick colour-coordinated components, Novoflex’s head certainly looks the part. The collapsible design enables it to pack small in seconds, but while the VR-System Slim tips the scales at a reasonably light 760g, the featherweight Nodal Ninja 3 is lighter still. Thankfully, the space-saving doesn’t compromise build quality, which is solid enough to support a mid-size DSLR without flexing, and the head is rated to support lenses from 8mm fisheyes through to 160mm telephotos. The locking clamps live up to this claim as they grip nice and tightly, however they’re too smooth to operate easily in all weathers. On the upside, the head features four click pan scales built into the base, while the upper arm also has click stops every 10 degrees to help set vertical angles when shooting multi row and spherical panoramas. Novoflex includes a useful hot shoe bubble level to help with camera positioning, but it’s not enough to justify the price difference over the Nodal Ninja 3. The baffling array of sliders and markings on this head is initially daunting, but it doesn’t take long to learn the basics and find the nodal point. Adjustment is excellent, so you can nail perfect camera positioning, and there’s even the ability to shoot straight down to easily capture the nadir image in a spherical panorama. The stout build and large slider travel also enables mounting of big cameras like an EOS-1D X or D5 - you can’t use these with smaller heads like the Nodal Ninja. Top quality engineering and materials ensure everything holds rock steady, though it does result in the 303SPH tipping the scales at a hefty 2.4kg. Fortunately it can be dismantled for more streamlined storage. However, value is questionable. Though it includes Manfrotto’s excellent 300N panoramic base which enables incremental click panning for consistent image overlaps - itself worth £229/$255 - the 303SPH has recently rocketed in price and is now getting close to the cost of the far more advanced Gigapan Epic Pro. Autopano Giga 4 by Kolor: The only image-stitching program you need?